The best hookah bar in Phoenix is owned by these two somewhat large Mexican guys who seem to be friendly with everyone. Every time I go there they end up offering me some type of deal, even if it’s just throwing me some quarters for the pool table, and they seem to constantly have a group of buddies hanging around as well. The walls do have really psychedelic neon-colored designs painted across it and also super comfy couches all around. The whole place reminds me of one of those friendly, stoner basements that belonged to that one friend whose parents were cool enough to let them decorate to their liking in high school. But when the owner came around the counter with my hookah ready, I saw that he was openly toting a pretty big pistol in his waistband, and I immediately felt uncomfortable. I also felt confused, because this hookah bar was in a pretty commercial area. Was this gun really necessary? Was he carrying the gun in plain sight like that to make potential troublemakers feel intimidated? Let me first say this: I have never liked guns. I grew up in Ohio, and while paintball guns and bb guns were a part of growing up in the woods with my brothers, I had made a firm promise to my 8-year-old self to never shoot a real gun in my life – not for hunting, not for self-defense, not ever. There was one time in college when I came home to visit my friend whose twin brother had been away serving in the National Guard for the last six months. He was showing everyone in the kitchen the new “Remington 870 express with extended mag tube” he had just purchased. I asked him if he had to get a license to buy it, and he said no. He just went to the store and bought it. This terrified me. I picked up the gun, the first I had ever held in my life, and to me it looked and felt like just a toy. I laughed and pointed it at my friend’s brother saying, “This can’t be a real gun.” Everyone in the kitchen threw their hands up and exclaimed that it was not cool what I was doing, and I immediately put the gun down and burst into tears. I had just pointed a lethal weapon at my best friend’s brother, like it was nothing. I ran off and cried and cried because I have thin skin and again made the promise to myself to never, ever shoot a gun. Or deal with one in any way. 2. Never point the gun at anything you don’t intend to kill/destroy. 3. Never put your finger on the trigger unless you intend to shoot. 4. Always be aware of your target and what lies behind it. Seemed simple and safe enough. Then the instructor took me into a conference room where he went over the rules again and also mentioned the common mistakes in some of the terminology people throw around with guns. He explained, frustratedly, that often customers come in and the first thing they do when they pick up a gun they’re hoping to buy is point it right at him. He said at the other gun range he works at, a person who did that would be immediately thrown out. But here, he just had to put up with it. It made me think about how real gun nuts probably haven’t taken a lesson beyond their first time shooting, and how the rules probably get relaxed and forgotten over time as a result. In this conference room, I learned how to hold the unloaded gun. I learned how to patiently wait for the click of the safety on the trigger and keep my finger on there for my next shot. 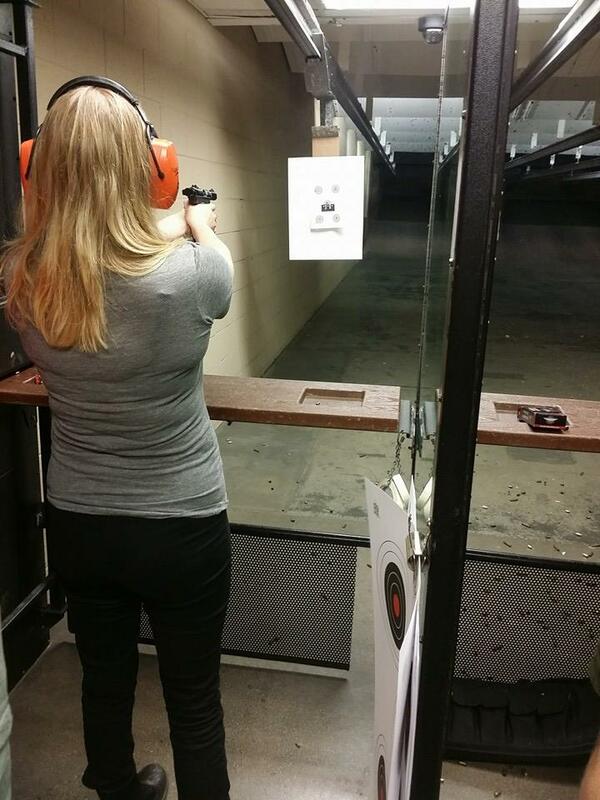 I also learned that shooting a gun is nothing like you see on TV or in movies (duh). There is no fancy stance you need to be in, just a relaxed position with your feet shoulder-width apart is best. And there is no need to anticipate the kickback. It’s loud, but it comes after you’ve already shot the bullet, so anticipating it will only put you off target before you even shoot. 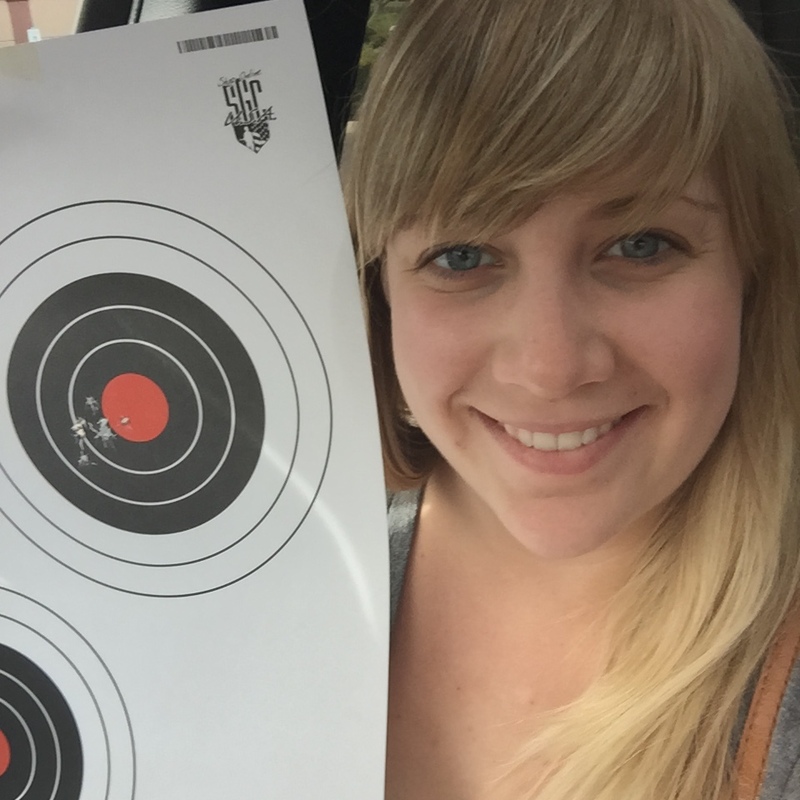 When I finally entered the gun range, my first impression was LOUD. These guns, which were much bigger and more powerful than the one I was about to shoot, would’ve definitely had my ears ringing for the rest of the week had I not been wearing headphones. Even with the headphones on, my ears were ringing for a couple of hours after my lesson. The guy next to me was shooting a huge gun, and it took me nearly the entire lesson to get used to the sound. Even fifteen minutes into being there, I was still jumping every time he took a shot at his target. As I went to take my first shot, I found myself terrified. I almost just handed the gun back to the instructor in tears and said, “Nevermind, I can’t do it.” But I took a deep breath and I did the damn thing. And as it turns out, I have pretty good aim. After refining my posture a few times (I have terrible posture whether or not I’m shooting a gun), I finally started to get the appeal. Loading ten bullets into my clip and keeping my finger on the trigger only to release and squeeze, release and squeeze with the safety, the whole experience actually felt sort of calming. Seeing the way gun nuts are on social media, I thought I would get some type of addicting thrill out of the experience, but it was the opposite. I enjoyed myself, sure, and I would honestly do it again, but the way I felt in that gun range was similar to how I used to feel diving into the pool and swimming laps for a few hours. Everything else just sort of disappears, and it’s just you and the target. There was no thirst to destroy, there was no rush at the kickback. It was just me and this glorified hole-puncher, trying to get as close to the center of my target as possible. I won’t say that I’m inclined to buy a gun now, but I would definitely take another lesson in a controlled setting like that. And if that makes me having turned over to the dark side in the eyes of my more liberal friends and family, then so be it. The way I chose to shoot a gun was the way guns should be shot, in a safe setting as a sport where no one is injured or in danger. I don’t know about needing them for self-defense, and I don’t really like killing animals for sport, but I don’t see the harm in taking a lesson and learning how to shoot a gun the right way. New experiences are why I chose to travel, and I can now say that I did a very “Arizona” thing while I lived here. Cheers to that! Superb well-written post! Kudos! I remember those days well…when I went to the pistol range with a new Stainless Steel Smith & Wesson 357 Magnum. You brought back all the feelings and weirdness of being a newbie with a powerful pistol and not knowing much more than that! Also, thank you for following my Randa Lane haiku site! Enjoy yourself, learn about haiku, and don’t be afraid to ask questions! I’m now a follower of your blog also and am still salivating after reading your “tamale” post! Yummm! Peace, love, joy my new haiku friend! Stay safe.